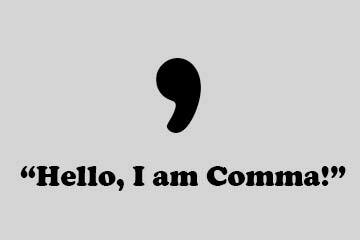 One of the most important punctuation marks is a Comma, the little tailed thing. A simple comma can alter the meaning of a sentence to complete opposite. Hence, knowledge of comma is obligatory for everyone. So, let’s see how a little punctuation mark like comma can be used. When two independent clauses are used in a single sentence it is called a compound sentence. Each clause qualifies for a single sentence having a subject and verb of its own. In such sentences a comma must be used before the conjunction. Carl ate a sandwich, while Mary had a banana shake. John wanted to get his book published, but the agent showed no interest in it. Sometimes commas could be misplaced win sentences having a complex predicate and a modifying phrase. Carl ordered a sandwich, and without offering to Mary, ate it all himself. Try to find a meaning to the sentence without the part enclosed in commas. Were you able to comprehend what’s wrong with the sentence? Carl ordered a sandwich and, without offering to Mary, ate it all himself. How a single comma can make such a big difference, got my point? Another case is when a comma separates two independent clauses in absence of a conjunction. Carl ate the sandwich alone, Mary was offended. There are two options to correct this sentence. First is to use a conjunction. Carl at the sandwich alone, thus Mary was offended. Or, you can use a semicolon instead of a comma. Carl ate the sandwich alone; Mary was offended. Carl, I need to go. Why are you leaving so early, Mary? I really need to go, Carl, so don’t try to stop me. A comma could be used when in a sentence an additional information is introduced in its midst, such that the information is not essential to the flow of sentence, but to the content itself. Carl, who goes play the guitar, is coming to meet me. John, a novice writer, wants to be a published author. An explosive batsman, Mathew Hayden is going to open for Australia. If you play for our team, we’ll definitely win the cup. Ever since he got divorced, he started visiting the church. I always carry a calculator, stapler, business cards, blank sheets, and a set of pens in my bag. Though, in certain cases different sets of series might be present. Each set must be separated with a semi colon. I am meeting Harry, Sally, and Adam on Tuesday; Jerry, Tom, and Raleigh on Saturday; and Jon, Paul and Robert on Sunday. The tortoise walked slowly, steadily, progressively to defeat the rabbit in race. Carl is an insensitive, lousy, stupid guy. Do you want go to Pizza hut for a pizza, or to Subway for a hotdog? Do you want go to Pizza hut for a pizza or to Subway for a hotdog? In the first sentence choosing one answer between the options is mandatory, while in the second sentence one can either say yes or no without a compulsion. That is, in the first sentence the one asking the question is giving the choice to chose between one of the two places, and it is certain that they are going to one of the places. While in the second sentence the one asking the question is giving the choice that if the other person wants to go to any of the place, or even to none at all.